"He will love the ground and if he runs the race he did last week I'd expect him to go very well." Coeur Sublime is a nice type who I've been looking forward to starting out over hurdles. He won his only start on the flat for Peter Fahey - beating a very smart horse in Southern France - after which Chris Jones bought him and sent him to us. He's a lovely horse with a nice way of going and he's schooled well so I'd hope that he will go close in a race that we won for Chris with Mega Fortune a couple of seasons ago. Monkeylou has the benefit of a previous run over hurdles having finished third at Ballinrobe in September when he ran quite a solid race. He's been schooling well at home since then and he's settled down quite a bit which should help him with regard to his hurdling career. He's got to step forward from Ballinrobe to be closely involved here but I think he will progress from that run. Viscount Wilson has had just a couple of runs for us. He finished down the field on the flat at Galway before finishing fourth to Smiling Eliza in a three-year-old hurdle at this track in late August. I think he will definitely come forward from that first run over hurdles and his jumping should be better too. Batts Rock will have his second run over hurdles in the two mile maiden. He did quite well on the flat for us this summer and he will improve for his first run over hurdles at Punchestown as he might just have needed that run and he would have been closer but for being hampered at the last. There's definitely more to come from him and he lines up with a decent chance. Defi Bleu is a nice type who should make up into a decent novice hurdler this season. He won a bumper at Navan last December and it was never the intention to do much more with him last season so he ran in a Grade 2 novice hurdle at Naas last February to pick up some experience for this season and I thought he ran better than his final position would suggest that day. He's been going nicely at home and I'm looking forward to getting him started but he will certainly improve for this run. I've been pleased with Stooshie's first two runs over hurdles this season. 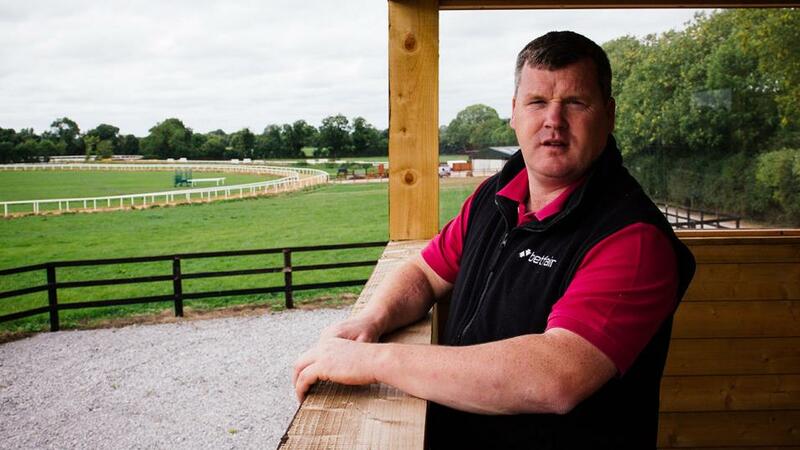 He shaped up well under a big weight in a reasonable handicap at Tipperary early last month and he did nothing wrong when he was second in a conditions hurdle at Punchestown last time. This is a step up in class for him but he is a strong traveller and a good jumper who looks like he will be well suited to handicaps like this. He should run well. Count Simon was kept busy over the summer and he was just a bit flat when he last ran at Kilbeggan in August so we gave him a nice break after that and he's come back in good form. Since going jumping he has just a Downpatrick novice hurdle to his name but I do think that there is more to come from him and I was encouraged by his second to Easy Game at Galway on his penultimate run. He's got to up his game to be involved but I wouldn't be surprised if he ran well. Outlander won this race last year and it would be brilliant if he could do the same this time around. He can be a little in and out but when he's good he is a very high class chaser and I was delighted with his comeback at Punchestown. He was beaten fair and square by Sub Lieutenant that day but he was giving him 10lbs on his first run since April so I'd be hoping that he will get much closer to him this time. He seems very well in himself and I know that if he runs his race he will be thereabouts. It's been a long road back for Don Poli who needed plenty of time off after picking up an injury just before last year's Gold Cup. Since he's come back into full work he's been doing well and he's showing us that he retains much of his old ability. Obviously he is going to need this run but I'd hope for a decent showing from him. The form he showed in the Lexus Chase and the Irish Gold Cup a couple of seasons ago showed that he was still a high class staying chaser at his best and he doesn't have too many miles on the clock so I do think we could have a decent season with him. The Storyteller is in good heart and it was always the plan to start back in this race. He won at Cheltenham for us last season and then signed off with a Grade 1 win at Punchestown in April where he was a very fortunate winner. Overall he proved that he was a classy novice chaser and I'm hoping for more of the same from him this season. He is a horse that tends to need his first run of the season so whatever he does on Saturday I know there will be more to come from him and possibly he will appreciate going a longer trip as the season progresses. Shattered Love took her form to another level when she switched to chasing. She just got better and better as the season went on and did really well to win two Grade 1 races against the geldings. Possibly slightly easier ground would suit her better but she's in good heart and she is going nicely at home. I'm not expecting her to be at her peak for her first run of the season but she is fit enough to give a good account of herself. Cecil Corbett is a reliable horse who loves decent ground so he is one who has been well suited by the very dry autumn. He won at Gowran last month and ran very well off his revised mark at Punchestown where I think he would have been much closer only for making a bad mistake at the fourth last. If he can match the form of his last two starts he should be closely involved. Presenting Julio just wasn't himself during the summer but I was encouraged by his run at Punnchestown last month and he improved from that to run well at Cheltenham last weekend, finishing third in a reasonable handicap chase. He will love the ground and if he runs the race he did last week I'd expect him to go very well. He looked good when winning his point-to-point in the spring after which he was bought to come to us and we're delighted to have him in the yard. He looks a very nice horse and he's been coming along well in his work so I'd be hopeful of a good showing from him. He's going to be better when he goes jumping but he shows enough to suggest he can go close in a bumper.